DEFEND+PLUS Prophy Paste contains balanced ingredients for a smooth, pliable and splatter-free formula that delivers superior polishing and stain removal properties yet is gentle to enamel. 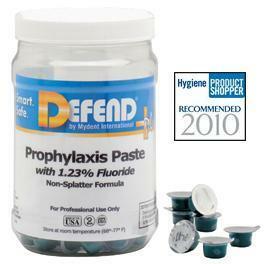 Gluten-free to assure against allergic reaction, DEFEND+PLUS prophy paste also contains 1.23% fluoride ion. Available in four great tasting flavors: mint, cherry, vanilla/orange, and bubble gum. Easily rinses clean with water. Unit dose cups, 200 per package.